Michael Gow isn't writing anything. The respected playwright and former artistic director of the Queensland Theatre Company has no plays of his own on the go. "It's been an intense year for me," he says. "A year of voluble, loquacious writers who can't shut up and kind of crowd out your brain. Sometimes it's all that I can do to keep up the journal entries." Indeed, 2011 has already seen him take on Goethe's Faustusfor Bell Shakespeare, and George Bernard Shaw's Pygmalionfor the QTC. But right now he is in the process of tackling a more contemporary colossus: Harold Pinter. "Cate, Andrew and I had been talking for a while about something the companies could together," Gow says. "No Man's Landis the one that jumped out at us." There were a couple of reasons for this, Gow says, and those reasons were named John Gaden and Peter Carroll. "The fact that you need two great actors," he continues, "who can remember it all and are prepared to get down and crawl around and all that, make it one of Pinter's more rarely performed works, and one of his hardest to get right". The fact that parts of Spooner and Hirst were originally played by John Gielgud and Ralph Richardson doesn't help attract pretenders to the roles: there's nothing scarier, after all, than a pair of huge, empty shoes. "Which is why we couldn't be luckier to John and Peter," Gow says. "They are intrepid, fearless performers. They're both devoted to their characters and are very at home in this production." "I'd worked with John a couple of times," he adds, "but never with Peter, and so that's been wonderful as well". As far as No Man's Landitself goes, Gow says the play, which is currently playing at the Drama Theatre in the Sydney Opera House, is among his favourites of the playwright's work. "And it was one of Pinter's, too," he says. "It was the one that a bit was read out from at his funeral. He was kind of devoted to it, I think, in part because it was one of his least successful." It is also one of his most characteristic: a slow-burn meditation on the fallibility of memory that, far from eluding meaning, has multiple layers that it demands its audience work through. "For all its poetic density and seeming randomness," Gow says, "it's still a very dramatic piece. It's basically a thriller without the clever plot and the stupid coincidences". "What I especially like about it is way it appears to be an ordinary, well-made play," he continues. "Because it actually isn't that at all. "It's really Pinter's funeral service for the well-made play." 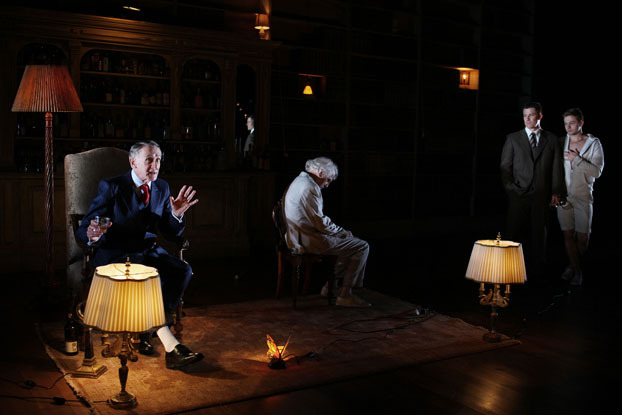 No Man's Land, Drama Theatre, Sydney Theatre Company, 1 November - 11 December, 2012.